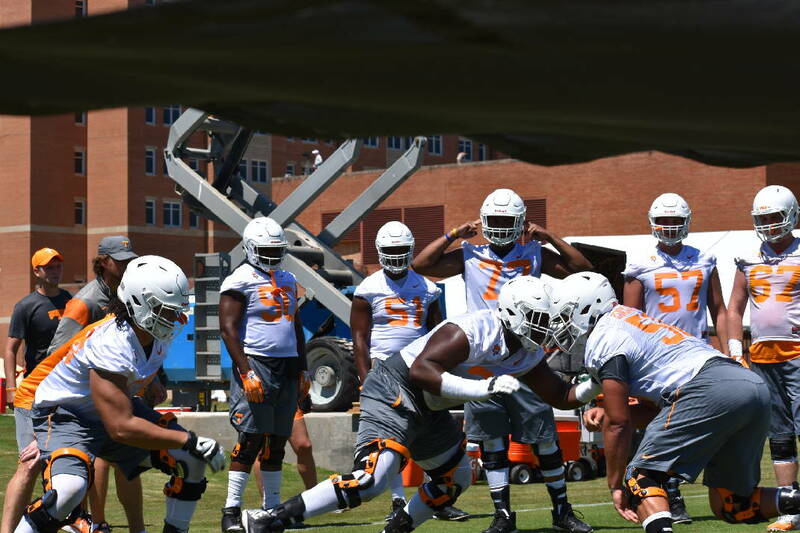 Freshman offensive lineman Trey Smith, center, blocks fellow freshman offensive lineman Riley Locklear during a drill at Tennessee football practice on July 30, 2017. KNOXVILLE — Wednesday's news from Tennessee football coach Jeremy Pruitt that sophomore offensive lineman Riley Locklear will miss two to three weeks because of an injury could create an interesting decision for the Volunteers. Locklear, who has been the team's primary backup at the guard spots, is still eligible for a redshirt. He played in the last four games of the 2017 season only because of widespread injuries on the offensive line. At the time, players who appeared in any game lost the ability to receive a redshirt. A new NCAA rule allows players to appear in up to four games and still receive a redshirt, which extends their eligibility for another year. Locklear has appeared in only three games this season for Tennessee (2-3, 0-2 SEC), which is off Saturday before playing at No. 8 Auburn on Oct. 13. Pruitt said on Wednesday's SEC coaches teleconference that Locklear's injury is a meniscus tear and that he has had surgery to repair the knee cartilage. A few emerging alternatives on the offensive line should keep Tennessee from having to rush him back from the injury and could provide the chance to consider redshirting Locklear, who still could play in one more game this season under the rule. Redshirt junior Chance Hall continues to progress toward full health after he missed all of last season and this year's spring practice session with a knee injury. Hall played guard in a reserve role during Tennessee's 38-12 loss at Georgia last week. Also, redshirt freshman guard K'Rojhn Calbert has drawn praise from Pruitt in recent weeks as he rehabilitates after several knee injuries throughout his high school and college career. Pruitt said on the "Vol Calls" radio show last week that he thinks the new redshirt rule was put in for players such as Locklear, who was on track to redshirt last season before he was forced to play. "So he basically got one year for (a few) games," Pruitt said. "So a guy like him would get to play another year if he chose to." This time around, the rule could help him save a year of eligibility as he returns from an injury of his own. Plus, it sounds like Pruitt is intrigued by what Calbert could bring to the unit. "He is a big man that can bend (and) has power," Pruitt said of Calbert. "He has lost weight and got into shape. I see the guy working every day to improve as a player, and he is only going to get better. He has finally got an opportunity where he can go practice, and you see it every day."